May you rest in peace. Your Brothers and Sisters in blue have it from here. God bless you and your family for sacrificing to protect us. May God grant them His grace, comfort, peace and love during this most difficult time. You all are truly heroes. My thoughts and prayers go out to Officer Collier's family and friends at this time. This tragic loss is not only felt by the MIT community, but the U of T community as well. As U of T lowers its flag, may the proverbial flag be raised in Heaven in honor of this brave soul. Everyday I walk by the site where you gave your life for us, and every day I will think of you as I walk to work and I will remind myself to live life with as much kindness, generosity, and bravery as you did. My condolences to his family and friends. He will never be forgotten. 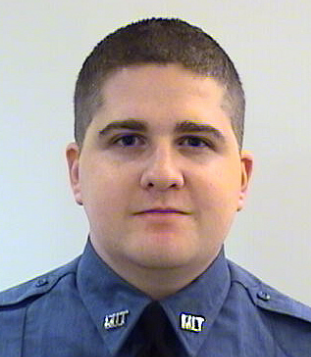 We mourn for the loss of Sean Collier, together, you are in our thoughts and prayers. With deepest sympathy and heartfelt thanks for all you do. Thank you for all that you do. My thoughts are with you. Remember that our community truly cherishes you all! Thank you for all you do for MIT our community today and every day. We are so sorry - with deepest sympathy and thanks - Judy B. Sorry to hear about the tragic death of a young man like this. Sean Collier you are a hero and a true patriot. You are all that is good. God Bless you and Rest In Peace. I am so sorry for your loss. Know that the people of this country will never forget the sacrifice of Officer Collier. We appreciate his protecting us and our familes, from the bottom of our hearts. May you find peace and healing in this time of sorrow. Thank you, Officer Collier, for your service. I send my condolences to the family and friends of this young man, as well as to the members of the MIT community to whose protection he dedicated and gave his life. So sorry for your loss at MIT and especially hope the family finds genuine comfort during this time. Rest in Peace. You will not be forgotten. I'll stop crying only to get over this difficult time with the same courage you've given to us and to forever remember and honor you, such a nice, responsible, brave person! My son is a student at MIT. We are thankful for protectors like Officer Collier who work to keep the MIT family safe. We are deeply saddened by the loss of Officer Collier. There is no balm that we can offer other than to say, "We care for you and mourn his loss." Deepest sympathies for your loss!! Condolences to his family, he died an honourable death doing his duty. My deepest sympathy and prayers to the MIT community and Sean's family and friends. May God give strength to everyone in this time of sorrow. NICE JOB BROTHER Rest in peace. Rest in Peace! Your a true hero, and will always be remembered, and never forgotten. My condolences to the MIT community, family and friends of Officer Sean Collier. It takes a special person to be an MIT officer. You have to know they see students in the midst of hacks and simply keep a watchful eye as they go about their hijinks. There are probably also moments they may have to stop students who are going a bit too far, and convince these incredibly bright kids that they might be making a poor choice that could affect them for a long time. And then there are the students who are at their absolute stress limits, who these officers might find doing things that could harm themselves or others. That ability to judge, moment to moment, how to handle the smartest people in the world as they strive and struggle and stumble through their young lives is a special gift. I sense from the little bit I have read of Officer Collier that he had that gift. It has been many years since I was at MIT, but we never forget our time there, to include all those seen and unseen who helped us through. My deepest sympathies to Officer Collier’s family and to the MIT community. The loss,of a brother is never easy. My sincerest sympathy. God has gained another guardian angel. With all the wonderful things I've heard about you, it saddens me to know that I didn't get to meet you. Despite the fact that we never got acquainted, it hurts my heart to have lost such a strong, loving individual that stole the hearts of so many MIT community members. I don't want to grieve anymore. Instead, I choose to take with me the memory of a great man who was loved by so many, and the inspiration to do good. You showed MIT your dedication to protecting the people you love, a quality I admire and hope to emulate to the fullest extent. And, maybe, we can all work together to make the world a more caring and compassionate place. For you, and for everyone else. My condolences to the entire MIT Campus Police force on the loss of Officer Collier, and to his family as well. As a student I had little direct interaction with the CPs -- a friendly greeting in the Infinite Corridor, a ride home across the river after SafeRide had stopped running, return of a wallet lost somewhere on campus -- but they were always friendly, helpful, and looking out for the MIT community. Thank you all of this service, and to Officer Collier for giving his ultimate sacrifice in the line of duty.